The secrecy of the 1944 Invasion of Normandy (D-Day) was apparent by the use of code names. Every aspect of the invasion was referred to only as code words. The entire operation had the code name Overlord. Security was kept as tight as possible, even the smallest compromises were call for alarm. The London Daily Telegraph crossword puzzles May - June 1944. 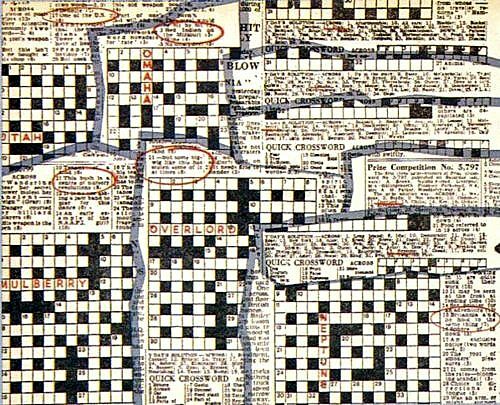 On 2 May 1944 a British staff officer doing the London Daily Telegraph crossword puzzle noticed 17 across: 'One of the U.S.' answer: Utah, the code name of one of the landing beaches. It was found that in previous months the words Juno, Gold and Sword (all code names for landing beaches) had appeared. On 22 May came the clue 'Red Indian on the Missouri': Omaha (landing beach). On 27 May the solution to ‘a Big-Wig' was Overlord. On 30 May the pattern continued with Mulberry (floating harbours used in the landings) and finally, on 1 June, the solution to 15 down was Neptune (code name for the naval assault phase). MI5 agents suspected that this was a coded warning to the Nazis. On 1 June they detained the compiler, Surrey schoolmaster Leonard Dawe, only to find out he knew nothing. For decades it was thought to be a bizarre coincidence. But in 1984 Ronald French, a schoolboy of 14 in 1944 and a former pupil of the crossword creator, revealed that he fed the words to the schoolmaster who would often ask his students for words for his next puzzle. The pupil picked up the terms while hanging around Canadian and American soldiers camped close by the school, awaiting the invasion. The soldiers talked freely in front of him "because I was obviously not a German spy". He believes that hundreds of schoolchildren must have known what he knew. I've heard this story before and I always feel bad for the school teacher. You have to wonder what he was thinking as he was being interrogated. Once watched this D-day story on national geographic and the documentary left me in wonders.